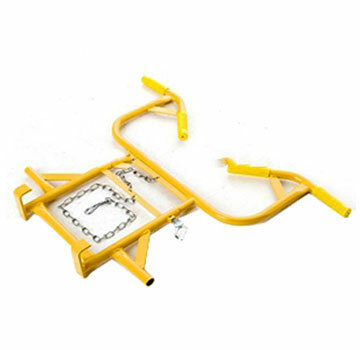 PRODUCT: ACRO 11710 Ladder Stand Off / stabilizer with Rubber Bumpers. Price/Each. DESCRIPTION: The all-steel Ladder Stand-Off makes any job working with ladders easier. It keeps your ladder away from gutters and buildings, allows working in corners, and supports your ladder against a wall or roofline. It is adjustable for different eave widths (22 - 28 inche) and different ladder widths. No additional hardware is required to put it on or take it off, and it locks in place with body weight on the ladder for extra stability. Keeps ladder away from gutters, tile or windows. Can rest against rooflines, walls, corner, chimneys. Fits easily on corners of buildings. Easy to attach and remove. Easy to store. Adjustable for different eave widths 22" – 28". Adjusts to any ladder width. All-steel design offers features not found on aluminum models. Acro 11084 Heavy Duty Roof Ridge Ladder Hook with Wheel. Improved Design with Quick Attach. Folds Flat for Easy Storage. Made in USA. Price/Each.